What Do Blind Spots Have to Do with Driving? In the automotive sense of the term, blind spots are areas outside of a vehicle that the driver is unable to see. Blind spots can be caused by the window pillars, headrests, passengers, and other objects. 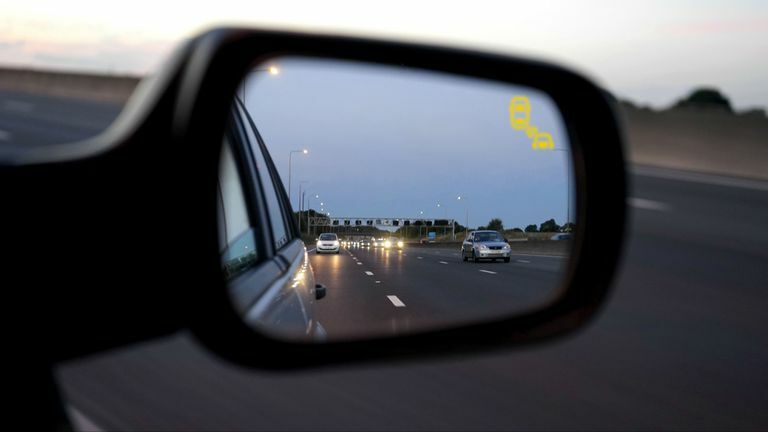 Special mirrors can help reduce, or eliminate blind spots, and blind spot detection systems use technology to provide a warning whenever another vehicle, pedestrian, or any large object enters one of your blind spots. What Causes Blind Spots in Cars? When you sit in a car, every part of the car that isn't glass creates a blind spot. That means vehicles with larger window pillars have larger blind spots, vehicles with smaller rear view windows have larger blind spots, and both cargo and passengers can also create additional blind spots. Blind spots are relatively small close to a vehicle, but they cover larger areas further away. At even moderate distances, a blind spot caused by an A-pillar can obscure large objects such as cars and people. Another type of vehicular blind spot exists in the space between the driver’s peripheral vision and the area reflected by the rear-view mirrors. This type of blind spot can swallow up entire vehicles, which is why it's so dangerous to change lanes without looking to the left or right. Mirrors can help remove blind spots behind a driver, but they typically leave large dead areas to both sides of a vehicle. The addition of a convex blind spot mirror can allow a driver to see objects that fall into that type of blind spot, but those images are distorted and can make it difficult to judge distances. It is also illegal to even install a blind spot mirror in some jurisdictions. Blind spot detection systems use a variety of sensors and cameras to provide a driver with information about objects that are outside his range of vision. Cameras can provide views from either side of a vehicle that allow a driver to verify that his blind spot is clear, and rear-view cameras can be useful when backing up or parallel parking. Some blind spot detection systems are able to tell the difference between a large object like a car and a smaller objects like a person, and they will simply alert the driver that there is a car or pedestrian located in one of his blind spots. When a blind spot detection system detects a vehicle, pedestrian, or large object enter a blind spot, they're capable of alerting the driver in various ways. Some systems use an audible alert, and other can display a simple warning in the corner of the rear-view or side mirror if there is a vehicle in the blind spot. What Cars Have Blind Spot Detection? Due to an ever-increasing focus on advanced driver assistance systems (ADAS), there are a number of different automakers that offer some type of blind spot information system. Volvo and Ford both use a sensor-based system that provides the driver with a warning if a vehicle enters his blind spot while he is changing lanes. Mercedes, Nissan, Chrysler, and many other automakers also their own blind spot warning, monitoring, or alert systems. Some vehicles have additional options, such as the blind spot intervention system that can be found on some late model Infiniti M-Series cars. In addition to alerting the driver when there is a vehicle in his blind spot, a blind spot intervention system can also provide resistance in the steering wheel if the driver attempts to ignore the warning. This type of system can typically be overridden if it malfunctions. Aside from OEM systems, there are also numerous aftermarket products that can add blind spot detection to virtually any vehicle. These systems can also be camera or sensor-based, and they vary in complexity from one product to the next. Does Blind Spot Detection Really Work? According to early data from the Highway Loss Data Institute, there were some important questions about whether blind spot detection actually results in fewer accidents. Another study from the NHTSA found that some blind spot detection systems didn't detect slow moving traffic that was moving in the same direction as the test vehicle. Common sense indicates that blind spot detection technology should help drivers avoid accidents, but the fact is that real life data doesn’t always line up with expectations. In a study performed by the HDLI, lane departure warning systems actually correlated with higher incidences of insurance claims. With that in mind, if you have one of these systems, it's important to remember that while they can help alert you to things you wouldn't otherwise see, there's no substitute for good situational and spatial awareness.